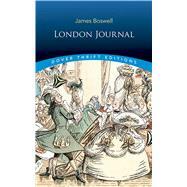 Even if James Boswell hadn't written the The Life of Johnson, he would be famous for this memoir of eighteenth-century London life. Boswell arrived in the great metropolis from his native Edinburgh in 1762, and he kept a daily journal of his nine-month sojourn. Bawdy, witty, and brimming with fascinating details, the accounts range from his illicit encounters with prostitutes to his momentous meeting with Samuel Johnson. Boswell's London diary disappeared for 150 years, finally turning up in the 1920s as the literary find of the twentieth century. Unlike his other journals, it escaped nineteenth-century bowdlerization, allowing the author's voice to emerge with strikingly modern candor. Boswell writes frankly of his struggles with depression and his sexual obsessions. His painstaking records of the lively repartee of his mentor's literary circle formed the backbone of The Life of Johnson, and just as that book proved him a worthy biographer, so this one shows him an equally captivating subject. The work of James Boswell (1740–95) is so well known that the dictionary defines "Boswell" as "a person who records in detail the life of a usually famous contemporary." In his case, the famous contemporary was Samuel Johnson, and Boswell's record of the great sage's life — combining memoir, conversation, and historical record — created a startlingly new and intimate approach that forever changed the genre of biography. With the 20th-century publication of his long-lost London Journal, Boswell emerged from behind Johnson's substantial shadow to prove himself as fascinating a subject as his friend and mentor.